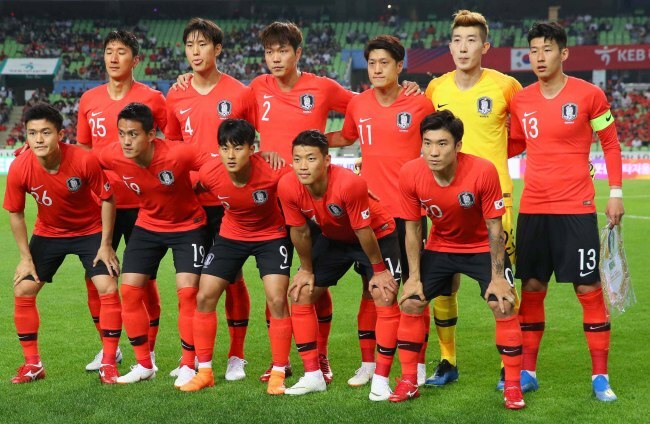 Moon had previously donned the national team uniform for the under-17 side, while Lee played at the U-17 and the U-20 levels with South Korea, but the match against Honduras was the first time that they competed for the senior national team. For Oh, it was the first time that he ever played for South Korea. Among the three, Lee and Moon had an impressive debut, leading South Korea's 2-0 win over Honduras. Lee, 20, made the surprise start against Honduras as a left winger in South Korea's 4-4-2 system, and showed his dribble technique in front of 32,000 fans at Daegu Stadium. In the 60th minute, he gave the ball to Son Heung-min to score an opening goal for the hosts. Lee, a product of the FC Barcelona youth system, didn't play full time, but he was one of the fan favorites in Monday's match. Moon, 25, entered the pitch in the 54th, but it only took him 18 minutes to score a goal. After receiving a pass from Hwang Hee-chan in the box, the winger finished with his left foot and made it 2-0 for South Korea. He is now the 33rd South Korean player to score a goal in his international debut. "I wasn't nervous at all," Moon said of his international debut. "Personally, I made some little mistakes, so it wasn't a perfect game for me." South Korean head coach Shin Tae-yong said he selected Lee and Moon because they can be a threat to World Cup opponents with their aggressive moves on the pitch. At the 2018 World Cup, South Korea are paired with Sweden, Mexico and Germany in Group F.
With Dijon FCO midfielder Kwon Chang-hoon and Gangwon FC forward Lee Keun-ho ruled out due to injuries, the two newcomers showed that they can fill the void of Kwon and Lee at the World Cup. Lee and Moon are looking to make the final roster of 23 players, which Shin is expected to announce this weekend after playing against Bosnia and Herzegovina on Friday. However, considering their latest performance, both are moving close to sealing spots on the 23 man roster. For Oh, it's a different story. The 30-year-old replaced Jeong Seung-hyeon in the 70th minute to make his international debut. He carried out the center back role in South Korea's back four with Kim Young-gwon and helped the hosts keep a clean sheet. Pundits, however, said it's too early to judge whether Oh is safe from the roster cut since Honduras didn't give a stern test to South Korean defenders.